We have a new colour brochure showing our range of beautiful hand-finished copper cookware. If you would like to receive a complimentary copy of our latest brochure, and 2019 price list, please enter your name and address in the form below and we will send both to you by first-class post. 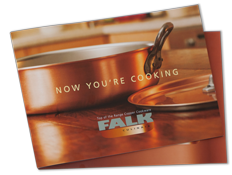 If you require any other information regarding Falk copper cookware, please do not hesitate to contact us for further assistance. All fields marked with an asterisk ( required) are required. Receive email updates for new products, promotions and other useful information - this is the easiest way to stay in touch and get all the latest news and information from Falk Culinair. Falk Culinair respect your privacy and will never pass on your details to anyone else. You will receive a maximum of one newsletter per month from us and can unsubscribe from our membership list at any time.